Embeds your calendar on your desktop picture. Is there a better alternative to Desktop Remind? Is Desktop Remind really the best app in Desktop category? Will Desktop Remind work good on macOS 10.13.4? 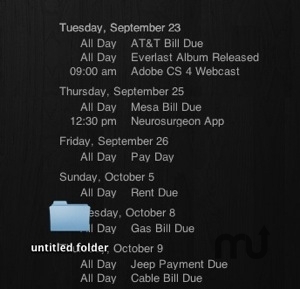 Desktop Remind embeds your calendar on your desktop, above your wallpaper but below your desktop items. With Desktop Remind you can quickly and effortlessly now exactly what is on your calendar for the current day, and beyond. Desktop Remind is user configurable, so you can place it exactly where you want on your desktop, and configure the font and font color to match your taste and/or wallpaper. Desktop Remind also works with multi-monitor setups. Desktop Remind needs a rating. Be the first to rate this app and get the discussion started!